Venue: Mairangi Bay Scout Hall, 20 Hastings Road, Mairangi Bay. We meet on the 2nd, 4th and 5th Sunday of each month. Meetings run from 10:30 to 5pm. Age of Sigmar Welcome to two new chaps playing Age of Sigmar. Sorry I didn't get your names! To round off the day, Phil, Philip and Rob had a couple of games of Splendor. 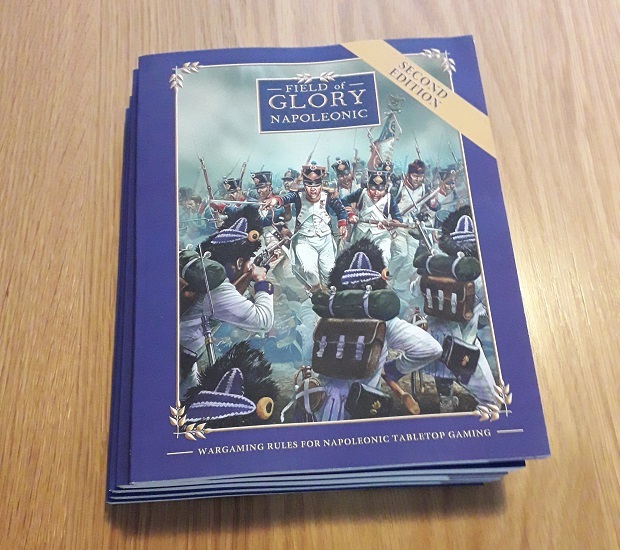 For the first meeting in a little while, the club had more games in periods other than Napoleonics, perhaps because of some of us getting some practice in for the Nationals. Vanguard - Alan and Phil had a Kings of War Vanguard game, with Kendall adjudicating. 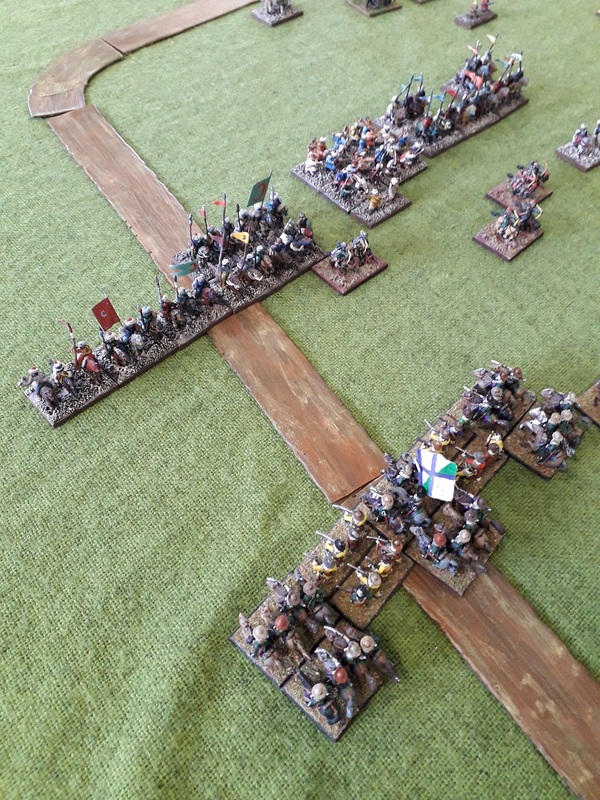 One of the original DBR armies at the club, Stu's French, takes on the newest, Rob's Ottoman Turks. Added Titan Terrain to our list of NZ manufacturers and suppliers. Titan is a Dunedin business making laser-cut terrain for sci-fi and WW2. Some nice stuff in there! There was a good round of applause for Kendall's work as secretary for the past 16 years! Fees are $50 for the year, or $5 a meeting for casual visitors. We will be organising several events throughout the year - Kings of Shore (KOW), Push of Pike (DBR 15mm), a Flames of War event, and a FOG-N event in the second half of the year. More details to come! Kendall and Rob had a game of Vanguard as a lead into a Kings or War game using Brotherhood and Kingdoms of Men. 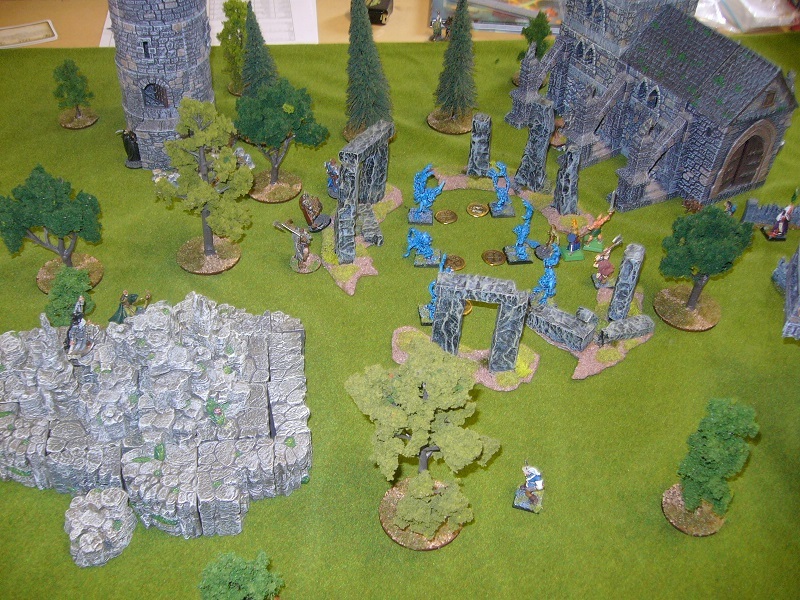 HOTT - For the first time in ages we played Hordes of the Things - a 15mm dbx fantasy game. Alan (Greek mythology), Kendall (Japanese), Mark (Byzantine) and Philip (Egyptians) played three games. And finally to finish the day we had several goes at the boardgame Splendor. After all the Napoleonic action was over, Rob and Philip had a game of Cruel Seas. The second edition of FOG-N has just been published. It's available to order from Amazon at US$35. There are a few copies for sale at the club if you want to pick one up here. A somewhat quieter meeting than usual with several of the club away at CanCon. Andrew had a couple of FOG-N games against Kendall and Corbon. Kit and Steve played some Flames of War Peiper scenario games on some excellent winter terrain. Congratulations to Mike for winning 2nd place in the FOG-N competition at CanCon. There were six NZers in the 14-strong competition, and as well as Mike's silver, 4th, 5th and 6th places went to us too. A good amount of shopping was done at the trade stands too. DBR 15mm. Grant (Spanish) played Mark (Ming Chinese). Expecting to see something of a revival of DBR at the club this year as we look forward to NatCon. Kings of War. Steve played a couple of games using Varangur taking on Kendall (Empire of Dust) and Rob (Kingdoms of Men). This was the last meeting before five of us head over to Canberra to play in CanCon! Vanguard - Continuing their tradition of introducing new games to the club, Alan and Kendall played a couple of Kings of War vanguard games. We also saw the first game of Cruel Seas, between Kendall and Rob. There were several other games too, Ben and Steve playing Flames of War, and Nico and Philip playing DBA using Sea Peoples and New Kingdom Egyptians. British and Spanish versus Ottoman Turks, FOG Napoleonics. DBMM 25mm Al the Spartan played Grant the Theban. FOG-N Corbon used a Russian army in two games, first against Kendall with Wallmoden's Corps 1814, and then against Brett's new Neapolitan army. Kings of Shore will be held on the 30th of September. As well as being a Kings of War tournament, this also doubles as the NSWC club competion for the Fantasy Trophy. This year's POP 15mm DBR competition was held here at the club. First place went to Mark Caunter using a Swiss army who achieved 3 wins and 1 draw. Second was Philip (Algerians) and third was Grant (Spanish Imperial). It has been two years since the last POP, so it was good to see the enthusiasm with several new and returning players. Next year we'll resume having a themed competition using 16th century armies in Europe. Kings of War - Greg (Orcs) played Simon who was using a Kingdoms of Men army using a 28mm English Civil War army. Frostgrave - Alan played Rob. Simon (Elves) played Greg (Goblins) in two games. Flames of War - Ben (Germans) played Steve (Soviets). Plenty of fantasy games on today - and welcome back to Andrew who has returnedg to the club. A couple of games of v4 Flames: Steve v Kit, and Lee v John. FOG-Napoleonics. Brett (French) played Marcel (Prussians) in his first FOG-N game. In a second game for both, Shaun then played Philip. FOG-Napoleonics. Mike (Turks) played Andrew (Prussians). This was a test of the new draft list for the Turks, mostly with irregular troops. Congratulations to Kit and Mike for taking 2nd and 3rd place in the Napoleonics tournament hosted by the Melbourne League of Ancients club. There were 7 New Zealanders (mostly from our club) in the 19-strong competition. Several other interesting games as well - Alan and Rob played Gaslands (an apocalyptic car wars game), and Greg, Grant and Steve had a couple of Saga games. Saga. We had a couple of Saga games - Alan vs Rob, and Greg vs Steve. Flames of War. John played Ray. Kit played John. FOG-Napoleonics. Brett (Austrians) played Andrew (French). The Austrians did more damage to the French than they suffered, but their smaller army was broken. Mike (French 1814) played Philip (British 1815). A British infantry flank march defeated the defending French. Two allied victories in FOW! Kings of War. Alan (Brotherhood) played two games with Philip (Empire of Dust), with one win each. The club's A.G.M. was held a little later this year because of the move to the new venue. Fees remain at $60 for the year. In this year's committee Kit is the treasurer, Kendall is the secretary, and Philip is the president. We agreed to run three tournaments - Kings of Shore (KOW), Flames of War, and Push of Pike (DBR). Kings of War. 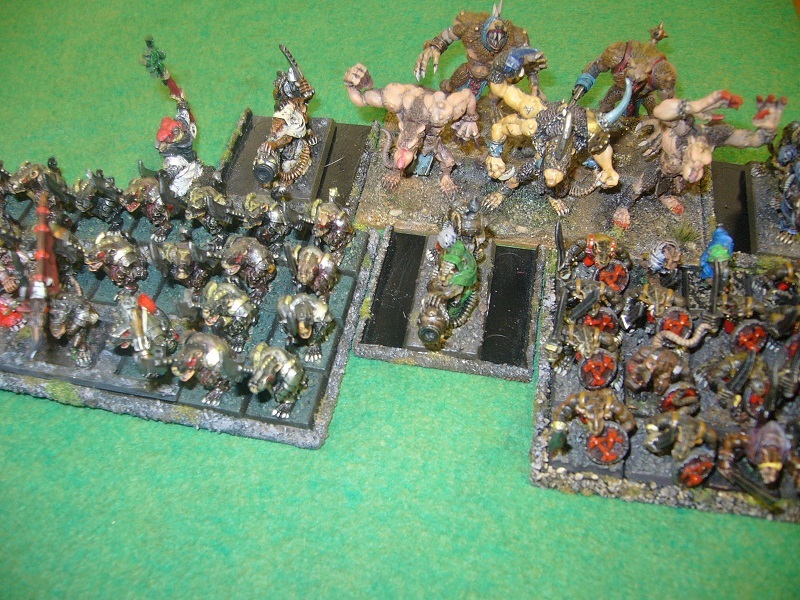 Alan had two games using his Goblin army, first against Rob's Dwarfs and then against Steve's Varangur. FOG-Napoleonics. Andrew (Prussians 1813) played Philip (British 1815). An outflanking Prussian division failed to arrive, but the rest of the army still won the battle. Kendall (Wurttemburgers) played Brett (French 1812). The Old Guard assaulted a hill defended by Wurttemburg infantry, but were defeated. This year's national convention was hosted by the Hamilton Immortals. 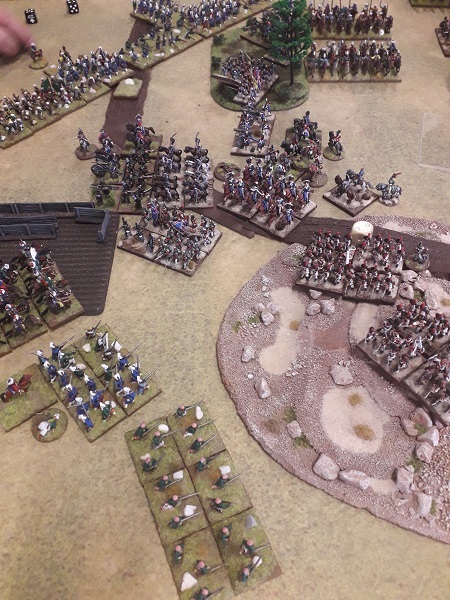 Attendance was around 100, and from our club there were 7 of us in the Napoleonics tournment, won by Andrew. Lee played in Flames of War and Rob was in the Bolt Action competiton. Everyone who attended got one of the well thought out goodie bags containing dice, a pen and superglue! 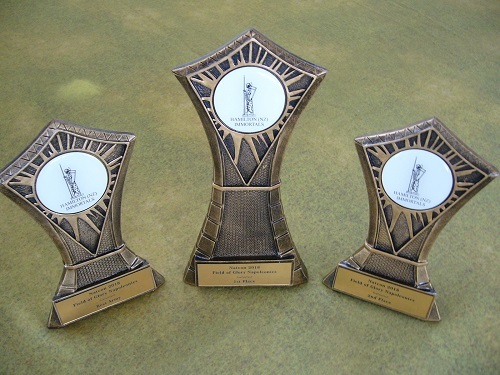 Prizes for FOG-Napoleonics: 1st Andrew, 2nd Kit, Best army - Kit's British. 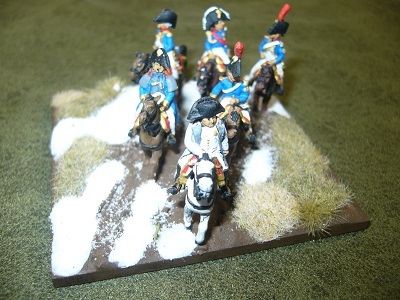 Other players won prizes of Blue Moon 15mm Napoleonic figures from Game Centre. Andrew (French cavalry corps 1814) played Al (British in France 1814), with a mutual break. Brett (Austrians 1809) played Mike (French 1814), also a mutual break. Stu (Mamlukes) played Philip (Netherlands 1815), this time a decisive victory to the Egyptians! As well as the Napoleonics game, there was also a couple of Flames of War games between Kit and Steve - Russians v Germans. Today we had our first meeting at the new hall. DBMM 240 25mm - Rob (Medieval Portuguese) played Philip (Libyan Egyptian). 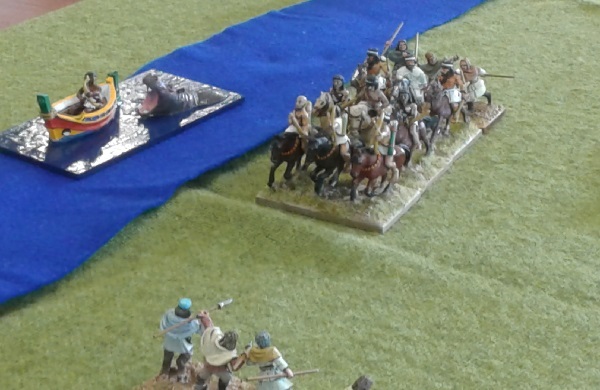 The Egyptian navy and hippo mascot looked on while the Portuguese knights ran down the Libyan infantry. 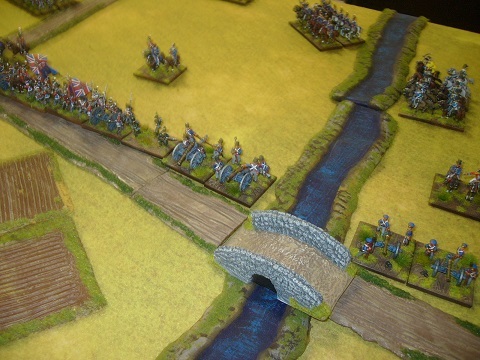 The French grand battery and infantry defending a hill contemplate the appearance of a big blue dice ahead of them. The Scout hall that we used isn't now available, so there won't be any club meetings until we move to our new venue. We'll announce the new venue as soon as details are confirmed. FOG-N. Philip (Netherlands 1815) played Brett (French 1814). A French outflaning move with 3 off-table divisions was defeated by the Dutch-Belgian frontal assault. FOW 4 - Steve (Russian) vs anonymous South African chap (Germans) played two games starring Broken Rudel. Congratulatios to Mike for winning first place in FOG-N at CanCon over in Canberra. There were six NZers out of the 12 in the tournament, and Mike's Ottoman Turkish army was the clear winner. We had a quiet club meeting on the last day of the year, but still got three tables up. 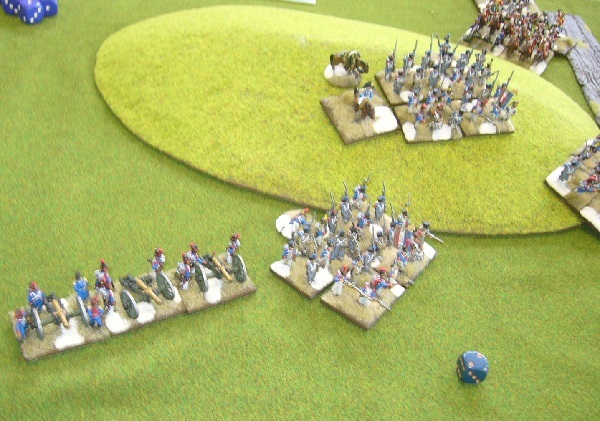 Kendall and Rob played some 25mm Napoleonics with Songs of Drums and Shakos using British and Turks. There were a couple of FOG-N games, with Andrew's French cavalry corps beating Stu's Mamlukes, and Mike's Turks beating Philip's British. Lots of Turks in all the games! Flames of War. Rob (Polish Home Army) played John and Steve, both of whom used German armies. Finally, Alan ran a game of Zombicide. Alan, Philip and Steve played the mistakenly named Survivors. In both game the defenders with Flexible Defence beat Frontal Assaults. Congratulations to Chris who won first place at the Kings of War tournament held at Mighty Ape HQ. There were 10 players in the competition, almost all of us from the NSWC. 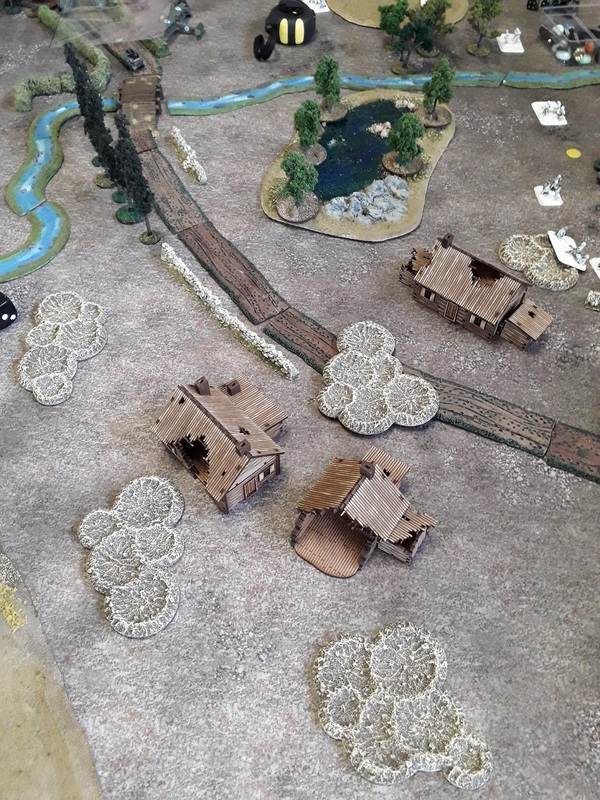 The event was also a good opportunity to show off terrain set up on DeepCut Studio table mats, at least two of which were ordered on the day! FOG-Napoleonics. Brett (1799 Austrians and Russians) played Mike's Ottoman Turks. Flames of War. Lee played two games, first against Ray and then John. Kings of Shore. 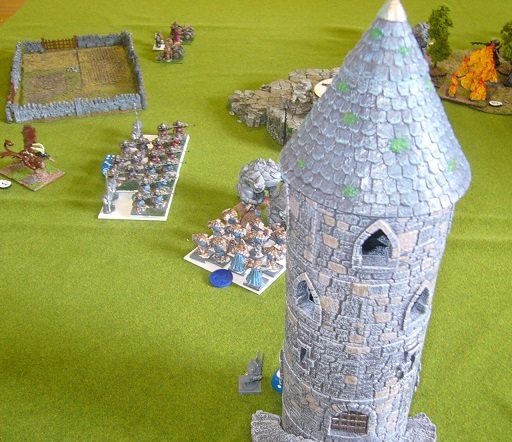 Our KOW tournament had a really good turnout - 18 players including several from out of town. Chris was the highest ranked NSWC player, so won the club fantasy trophy. Brett's army of Eureka frogs won the best painted army prize! A good variety of games at the club today - some Flames of War, lots of Kings of War (ten 1250 point games with Alan, Chris, Rob, Brett, Steve, Kendall, Kit, Mike, Simon and Bruce), and some 20mm Crossfire WWII with Bruce, Steve and Braith. 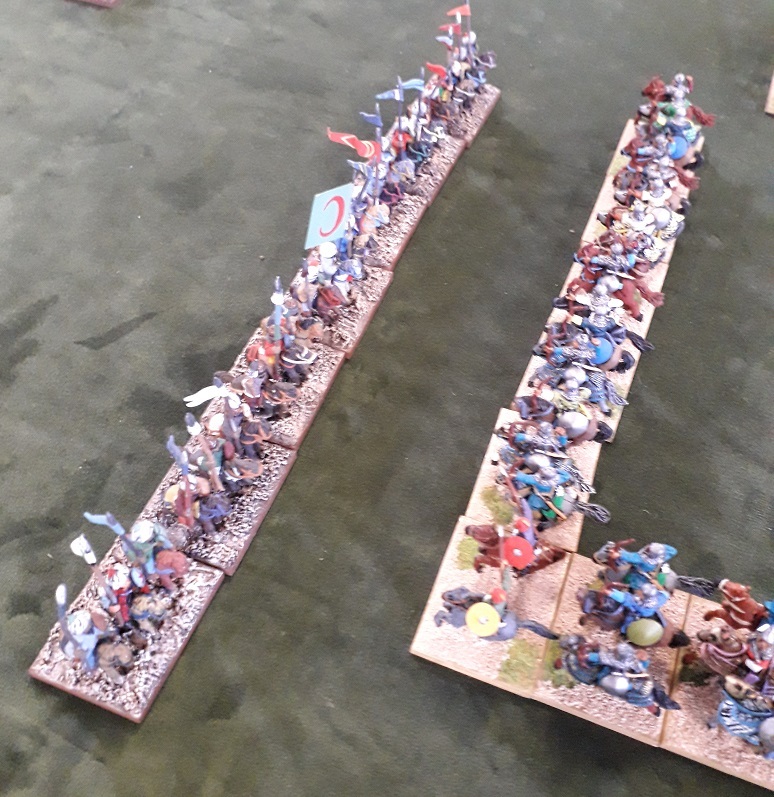 With the Kings of Shore tournament coming up at the end of the month, we had lots of practice games using 1250 point armies. Players and forces were: Alan (Basilean), Kendall (Empire of Dust), Philip (Empire of Dust), Chris (Empire of Dust), Braith (Brotherhood), Simon (Elves), Mike (Abyssal Dwarfs), and Kit (Orcs). Other games included FOGN - Stu's Mamlukes taking on Andrews Russians and Austrians - and some Crossfire games with Bruce, Braith and Kit. Kings of War - Steve Varangur had a couple of games using the Varangur, first against Philip (with Empire of Dust) and then again against Philip and Braith. Two wins to Steve! FOG-N - Andrew (British in Egypt) played Philip (Revolutionary French). Brett played Mike. Songs of Drums and Shakos - Kendall and Braith had a game of SDS. Another really well-attended meeting today with lots of games going on. Tanks. Braith had a couple of games, against Kit and Mike. Kings of War. Alan (Goblins) played Philip (Herd). Kings of War. Rather a good turnout for KOW this meeting! FoG-Napoleonics. Brett (French) played Mike (Spanish) and Andrew (Russians) played Kendall (Wurttemberg). Simon (Elves) played Philip (Kingdoms of Men). This was the first game for Simon's Mantic Elf army, winning the Invade scenario 5-3. FoG-Napoleonics. Mike played Andrew twice, firstly Spanish v French and then Spanish v Russians. Rob and Kendall played a Bolt Action game, both using British Paras. 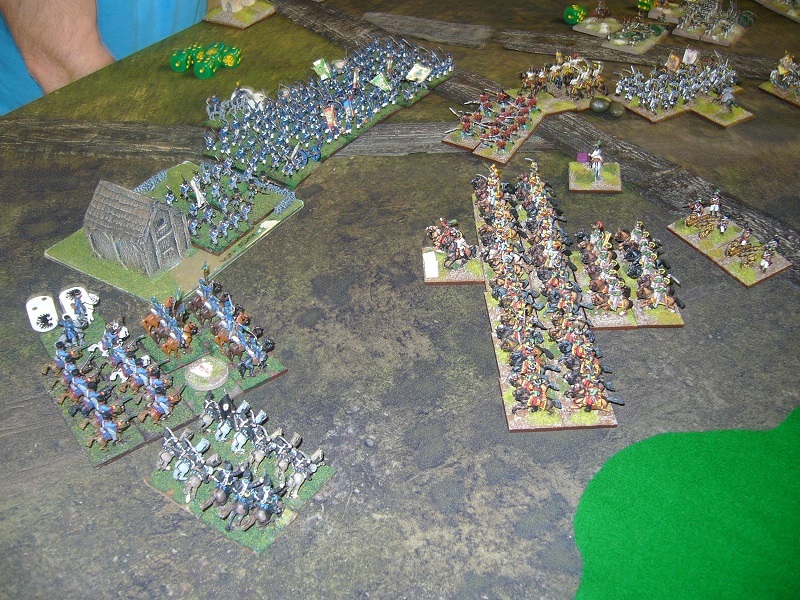 They then had a Kings of War game, this time both using Dwarfs. Kings of War - Rob (League of Rhordia) played a couple of games, first against Alan (Undead) and then Chris (Ratkin). We had several games at the club today. This picture is of one of the Napoleonic games - Kit's 1815 British playing Philip's French. The Nationals were held at the Woolston Workingmens Club in Christchurch over Easter weekend. The event was well attended, although there was a very low turnout from Auckland clubs and Rob and Philip were the only NSWC members there. Rob won 1st place in Kings of War with his Dwarf army. 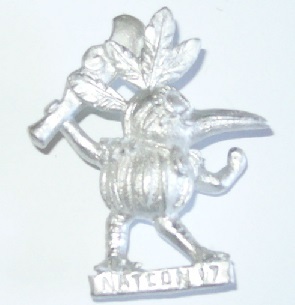 Amongst the loot bag was this souvenir figure of the Natcon Kiwi! A busy day at the club today - 5 games of Flames of War, 4 of Kings of War, and 1 of FoG Napoleonics.